From blogs to landing pages to ads, the right keywords help customers find your content. To know what keywords your customers are searching for, it helps to know how to use Google Adwords Keyword Planner tool. This tool, available to anyone with a Google Adwords account, gives you a long list of data to help find broad or long-tail keywords. 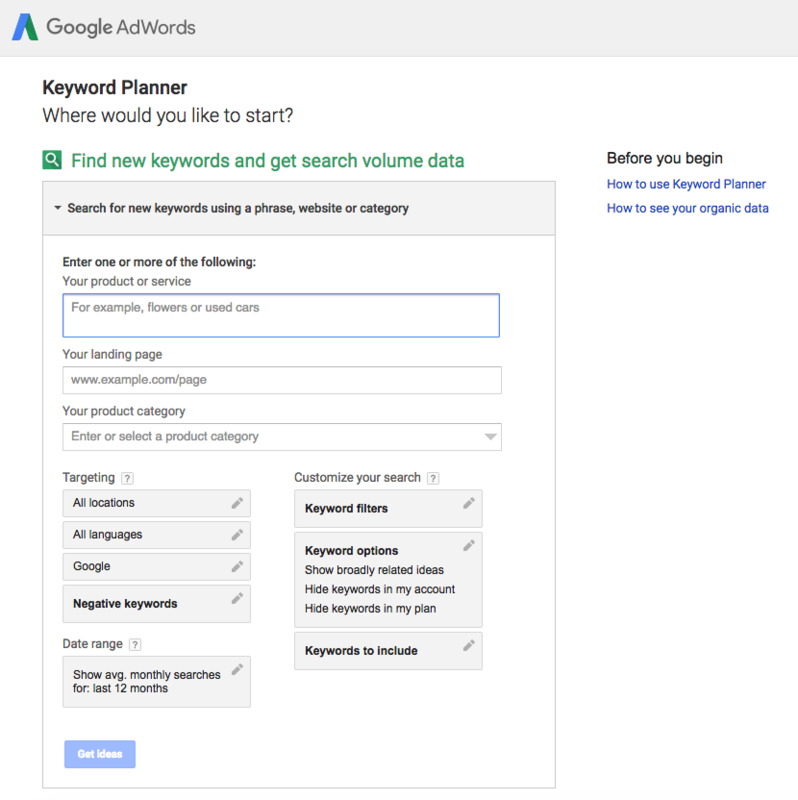 We’ll show you how to use Google Adwords Keyword Planner step by step to find the right keywords. If you’re new to Adwords, start at the beginning. If you’re experienced, skip to the bottom to get some insights on choosing converting keywords. You can find the Keyword Planner from your Adwords dashboard by clicking the wrench icon towards the top right. From here, you’ll see “Keyword Planner” on the left side of the dropdown menu. 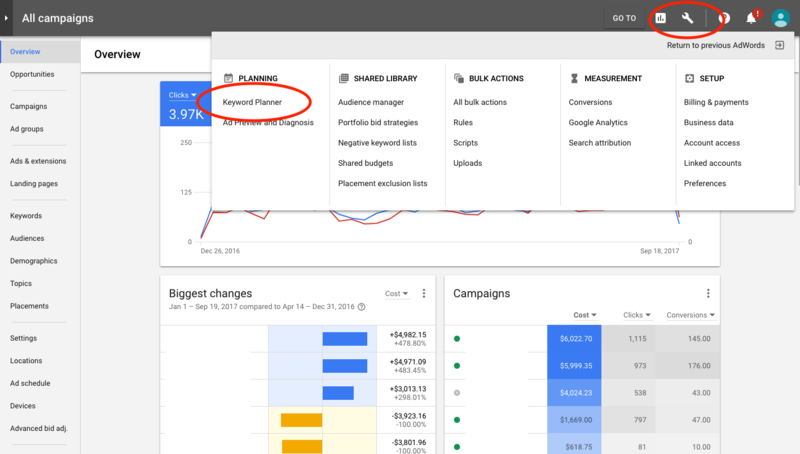 Since it’s part of Adwords, Keyword Planner is intended to help you optimize search ads, but you can use it for blogs, web pages, landing pages, product pages, and more. Note: Google tools and interfaces are constantly changing, so your page may not look the same. Before you learn how to use Google Adwords Keyword Planner, it’s important to choose your marketing content topics and goals. Are you looking for broad keywords for a services page of your website, niche keywords to target a specific audience in a PPC campaign, or long-tail keywords for a blog? 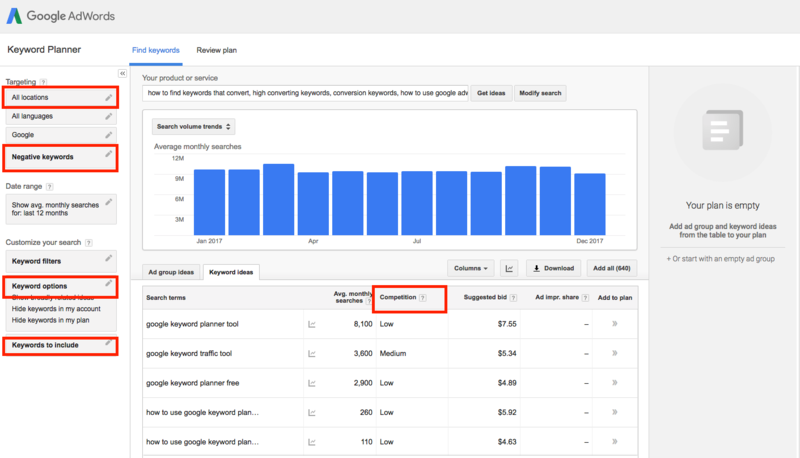 Google Adwords Keyword Planner will tell you what keywords users search and how often, but it won’t tell you which keywords are best for which content type. That’s up to you! If you’re not sure how to refine your topic, here are some other tools and strategies to start with. Competitors’ Keywords: Why remake the wheel? Tools like SEMrush and Raven Tools can show you what keywords your competitors are targeting. Use these by themselves or use them with the Keyword Planner as a starting point. Long-tail Blog Keywords: Answerthepublic.com will show you questions surrounding a particular topic. This is great for writing instructional business blogs and how-tos with long-tail keywords customers will actually search for. Autocomplete: Start a question or put in a topic in the Google search bar, and it will suggest searches most commonly entered by other users. Related Searches: You can also see terms “other users also searched” at the bottom of the page. Use these terms and autocomplete together to narrow your topic to a particular niche. Now that you have a better idea of what you’re looking for, knowing how to use Google Adwords Keyword Planner will be more helpful. 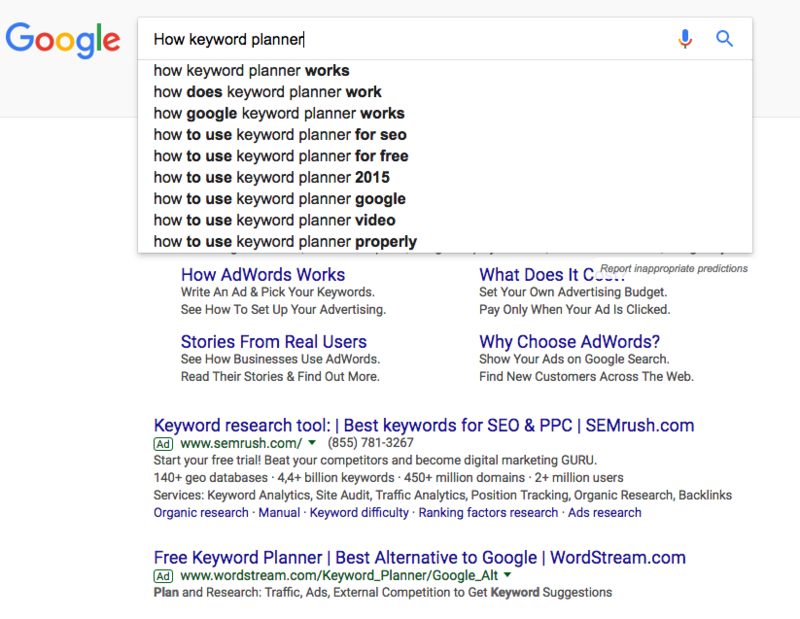 If you found the right keywords from your previous research, the Keyword Planner will give you the numbers on actual search volume and competition, so you can make sure it’s the right choice. If you need more ideas as well as data, use the first option on the Keyword Planner page. Using your previous research, try entering the keywords you found, the URL of a top result, or a competitor’s URL. Use just the first box for now, you can refine your search more later. Click “Get ideas” at the bottom of the drop down menu to start. Next you’ll see search volume and competition of the keywords you entered, and you’ll see a list of keywords underneath suggested by Google. There might be hundreds of suggestions, and many probably aren’t what you’re looking for. Ideally, you want keywords with high search volume and low competition that are also directly related to your topic. There are a few ways to narrow in on these gems. Sort By Competition: Click the “competition” header at the top of the suggested keywords twice to sort by lowest to highest competition. While these terms will probably have lower search volume, you’ll have less competition to beat for top spots. Enter Negative Keywords: Near the top left you’ll see “Negative Keywords” in bold. Enter any irrelevant terms here to eliminate them from results. Use Keyword Options: Refine your results using the “Keyword options” box in the lower left. Click “Only show ideas closely related to my search terms” to eliminate some off-topic keywords. This works better when you start with a longer list of keywords. Include Select Keywords: Towards the bottom left, use the “Keywords to include” box to refine your search by specific terms. For example, if you’re only interested in purchase-related keywords, you might enter “buy,” “prices,” and “for sale.” Any results that don’t contain at least one of the keywords you specify will disappear from the list. Use Locations: At the top left, you’ll see “All locations.” Here you can enter a country, state, or city to show only results from users in that area. If you’re only interested in customers close to your store, this will be especially helpful. Keep in mind that limiting the pool of results to a small area might also eliminate some niche, long-tail keywords. If you already narrowed the list to one low-competition, high-volume keyword, you can skip this step. But if you’re choosing from a short list, you’ll want to dig a bit deeper to pick the perfect one. Click the “Add to plan” arrows to select your list, then click the blue “Review plan” button that appears in the lower right. This screen gives you more data on each keyword, such as estimated conversions, impressions, and costs. This is intended for selecting keywords for an ad campaign, however you can use it to improve SEO elsewhere. Click the “Keyword” tab above the graph to see information on individual keywords. Enter a bid and budget to get more data (don’t worry, you don’t have to actually buy any ads). 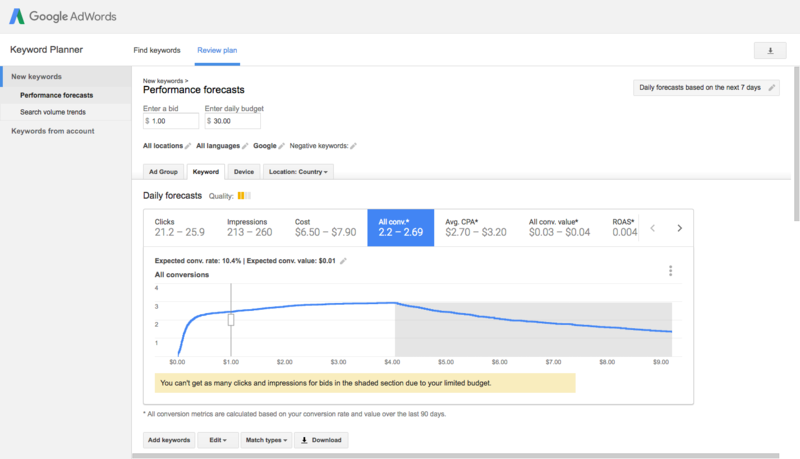 If you’re new to Adwords, Google may not have enough information to make forecasts, so some of this information may not yet appear. What keywords you pick will depend on your goals. All searches and estimations are different, but here are some general rules to start with. Conversions: If you’re looking for keywords that will turn website visitors into leads, look for the highest click-through rates. This means these keywords tend to drive more action than others. Build Brand: If your main goal is exposure, look for keywords with the highest number of impressions and the lowest cost. This means more people are more likely to see your content and less likely to be distracted by competitors. Increase Readership: If your main goal is to get visitors to read your blog or articles, look for the highest number of clicks. Advertising: If you’re buying these keywords for a PPC campaign, you’ll want to look at a combination of metrics. Compare click-through rates, clicks, total costs, and costs-per-click to find the right keyword or group of keywords. Understanding the basics of how to use Google Adwords Keyword Planner can help you find the right keywords for almost any online content. Keep in mind that the right keywords are only part of the solution; you’ll also need to execute SEO properly, write quality content, utilize marketing strategies, and place your content on a user-friendly, attractive website to drive conversions. With these elements in place, you can put your content to work turning visitors into leads.